As heard on Newstalk WTIM 96.1, Taylorville defeated Quincy Notre Dame by a final score of 76-46. As heard on Genuine Country 94.3 WMKR, Central A&M defeated Odin by a final score of 54-40. Here is your morning sports report as heard on the Miller Media Group of stations on Wednesday, February 27, 2018. Here is the morning sports report as heard on the Miller Media group of stations on Monday, February 25, 2019. 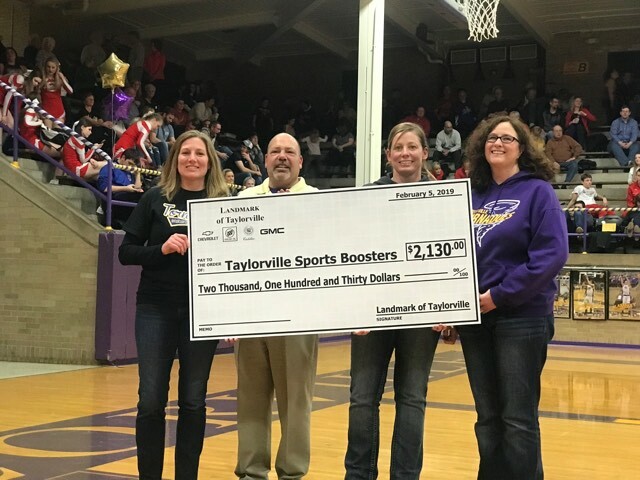 This past season Landmark of Taylorville donated ten dollars for every first down the Taylorville Football team achieved, in total a check for 2,130 dollars was given to the Tornado Sports Boosters. Jason Johnson is the General Manager at Landmark of Taylorville he says they are coming up on five years of doing this and the money is making a difference for all Taylorville sports. Landmark of Taylorville has been donating three dollars for every 3 point basket made by the Taylorville Basketball teams this season. As heard on Newstalk WTIM 96.1 WTIM, Taylorville lost to Effingham by a final score of 68-55. As heard on Genuine Country 94.3 WMKR, Central A&M defeated Tri-City by a final score of 70-43. As heard on Newcountry.fm 98.3 WSVZ, Shelbyville lost to Marshall by a final score of 76-57. As heard on Genuine Country 94.3 WMKR, Central A&M defeated Okaw Valley by a final score of 73-40. As heard on Groovy 97.3 WRAN, FBCA defeated Mississippi Valley Christian by a final score of 54-44. As heard on Newstalk WTIM 96.1, Taylorville lost to Alton by a final score of 58-55. As heard on Newcountry.fm 98.3 WSVZ, Shelbyville defeated St. Teresa by a final score of 55-49. As heard on Newstalk WTIM 96.1, Taylorville defeated Lincoln by a final score of 44-41. As heard on Genuine Country 94.3 WMKR, Central A&M defeated Tri-City by a score of 69-34. As heard on Newcountry.fm 98.3 WSVZ, Shelbyville defeated Mt. Pulaski by a final score of 63-56. As heard on Newstalk WTIM 96.1, Taylorville defeated Auburn by a final score of 63-47. As heard on Newstalk WTIM 96.1, Taylorville lost to Civic Memorial by a final score of 37-29. As heard on Genuine Country 94.3 WMKR, Altamont defeated Central A&M by a final score of 65 to 55 at the end of tonight's sectional game. As heard on Groovy 97.3 WRAN, Champaign defeated Faith Bible Christian Academy by a final score of 66 to 48. As heard on the Newstalk WTIM Network, Taylorville defeated Lincoln by a final score of 60 to 34. As heard on Groovy 97.3 WRAN, Champaign led Faith Bible Christian Academy by a score of 31 to 29 at the end of the first half. As heard on Groovy 97.3 WRAN, Faith Bible Christian Academy led Champaign by a score of 13 to 10 at the end of the first quarter. As heard on the Newstalk WTIM Network, Taylorville led Lincoln by a score of 29 to 16 at the end of the first half. As heard on Newcountry.fm 98.3 WSVZ, Shelbyville defeated Dietrich by a final score of 75-40. As heard on Genuine Country 94.3 WMKR, Robinson led Central A&M by a score of 26 to 25 at the end of the first half. As heard on Newstalk WTIM 96.1, Taylorville defeated Mahomet-Seymour by a final score of 74-50. As heard on Newscountry.fm 104.1, Taylorville lost to Mahomet-Seymour by a final score of 63-55. 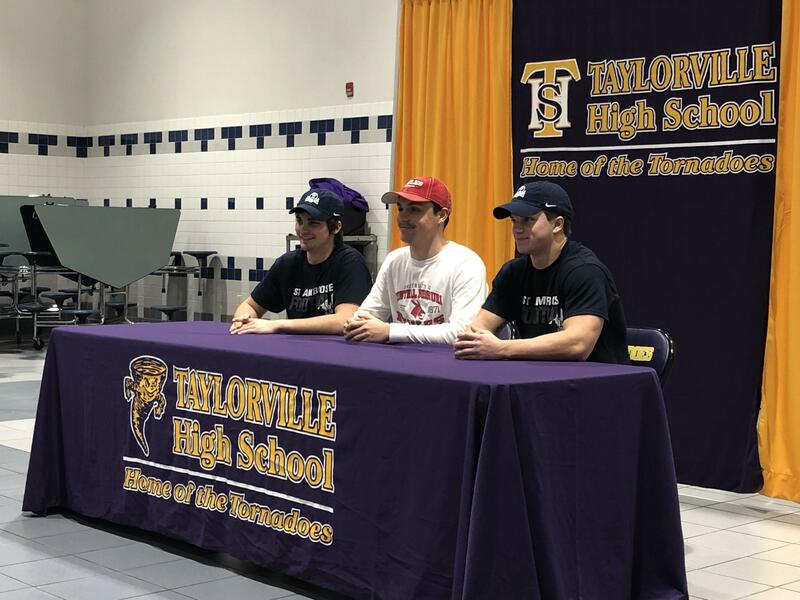 3 Taylorville High School football players signed their letter of intent to play football at the next level. Wide receiver Justin Wright, linebacker Riley Buschon, and quarterback Brandon Odam all made their commitments official. Wright and Buschon both signed to play at NAIA school St. Ambrose University. Wright said he is glad to have the orcess finished, and looks forward to playing at the next level. Odam, who committed to the University of Central Missouri, says it’s weird to be committed, but looking forward to the next level. His Head Coach, and Uncle, Jeb Odam had a lot of great things to say about the trio who shook up the record book at THS. Including Odam setting 16 records, many of which were held previously by the coach himself. As heard on Newcountry 98.3 WSVZ, Shelbyville defeated Clinton by a final score of 51-47. As hears on Newstalk WTIM 96.1, Taylorville lost to Mattoon by a final score of 68-65. As heard on Newstalk WTIM 96.1, Taylorville lost to Lanphier by a final score of 68-53. As heard on Newstalk WTIM 96.1, Taylorville defeated Pana by a final score of 82-45. As heard on the Newstalk WTIM Network, Taylorville defeated Mt. Vernon by a final score of 73 to 53. As heard on the Newstalk WTIM Network, Taylorville led Mt. Vernon by a score of 58 to 32 at the end of the third quarter. As heard on Genuine Country 94.3 WMKR, Central A&M defeated Warrensburg-Latham by a final score of 62-45.